Life In A Pink Bunny Suit: Hook and Needles: There's a YARN TRUCK!!! because I forgot my iPhone at home....duh moment! But a truck with yarn? 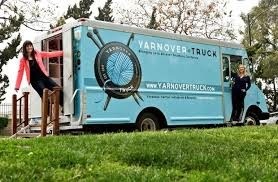 May I introduce you to the Yarnover Truck, carrying lots of luscious yarns to locations all around Southern California? And I got to touch all these beautiful yarns! And the label is just too cute, don't you think? This truck makes me just want to go out and learn to knit!